Except the great ancient cities of Uzbekistan, this educational tour includes a trip to the Aidarkul Lake with an overnight stay in the yurt camp, as well as an introduction to the life and traditions of the population of the mountain village. Morning flight Urgench (1100 km, 1 hour 40 minutes of flight). 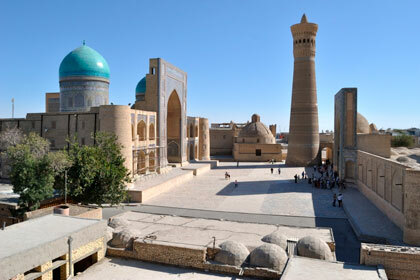 Transfer from Urgench to Khiva (30 km, 30-40 min). 11:00 Beginning of the city tour Khiva. 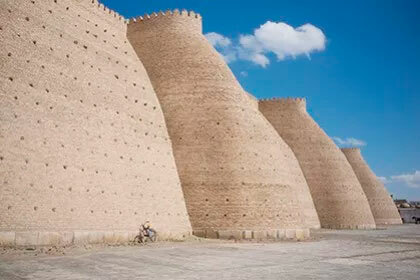 Spend the day at Fortress, a UNESCO World Heritage Itchan Kala - an open-air living museum. 14:00 Lunch at the Uzbek restaurant. Mosque and minaret of Jami. 20:00 Dinner at the Uzbek restaurant with folk live music. 06:00-07:00 Breakfast at the hotel. 08:00 Trip to Bukhara (500 km, 6-7 hours). Excursion. To the west of the Citadel Ark, long before Bukhara was conquered by the Arabs, there appeared a lively city center - Registan Square. 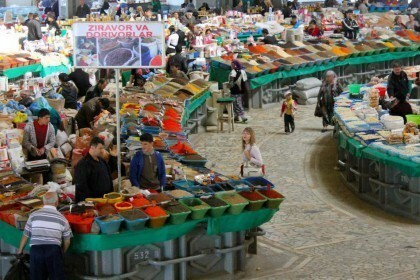 In the XVII century on the outskirts of the square were the ranks of the market. 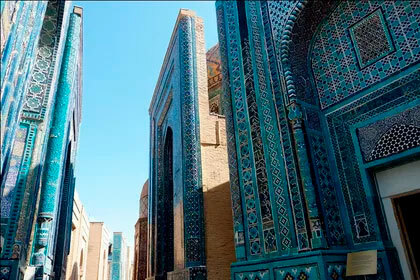 One of the caravan roads connecting Bukhara and Khorezm led to the square from the city gates of Dashtak. Fortress Ark is the residence of Bukhara khans. According to the latest excavations, it was determined that the citadel was in this place from the 4th century BC. 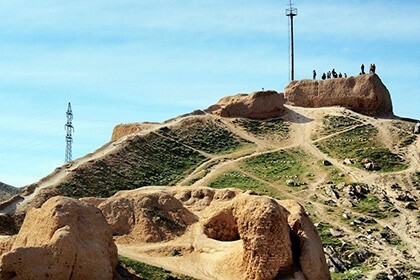 During many years of construction and destruction, an artificial hill 20 meters high was formed; its upper layers were built during the last Bukhara emirs. Poi Kalyan Complex: Kalyan Minaret and Kalyan Mosque. Dinner at the Nadir Divanbegi Madrassah with traditional folk and fashion show. 07:00-09:00 Breakfast at the hotel. The beginning of the excursion around the city of Bukhara. 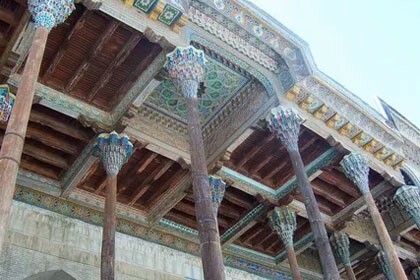 The mausoleum of Ismail Samani is a world-famous architectural masterpiece, built in the late ninth century. 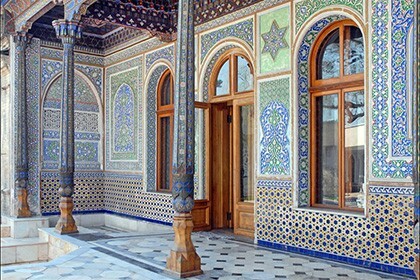 The mausoleum was built as a family crypt immediately after the death of the father of Ismail Samani. Chashma-Ayub, translated as the source of St. Job. According to legend, the biblical prophet Job, visiting this land, decided to help people suffering from a shortage of water in the desert. He struck the ground with his staff and created on this place a source of crystal clear water. The Bolo-Hauz complex, consisting of a reservoir, a Friday mosque and a minaret. The architectural ensemble of Lyabi-Hauz, formed by three large monumental buildings: the Kukeldash Madrassah, the khanaka and the Nodir Divan-begi madrassah. From the south the square was bordered by Torgovaya Street. Trading domes of Bukhara - the famous eastern bazaars - domes stretching from Lyabi-Khauz to the Miri-Arab madrassah. In the morning leave Bukhara and go to the village, located in the Nurata Mountains (330 km, 5-6 hours). On the way we will stop in the workshop of the masters of ceramics in Gijduvan. Excursion in Nurata: the complex of Nurata is a place of worship of local people. The complex consists of a Dervish monastery with rooms for a ten-day and forty-day vow, a 16th-century mosque erected in 1580 by Abdullahan Sheibani, instead of a fire-worshiping temple (founded in the 9th century), a sacred source of Nur, the remnants of the fortress of the watchtower of Alexander the Great. 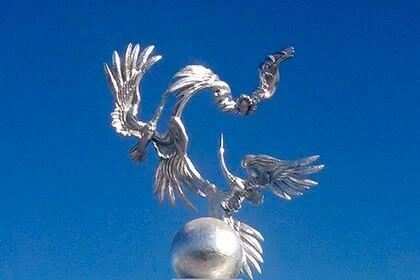 Local people themselves believe that the purest water and Islam are the most important riches that God has given them. Around the city, many springs with crystal clear water are considered sacred. Fish living in springs and in a pond are also considered sacred, they do not eat it. Transfer to the yurt camp in the Kyzylkum desert. Before us are panoramas of huge barkhans overgrown with saxaul. Accommodation in yurts. The camp is located 10 km from the western coast of Aidar Kul lake. In the camp there are 23 yurts, which are richly decorated with handmade carpets of local craftsmen. Color patterns and chandeliers create an unusually festive atmosphere in the yurt. Yurt camp is also equipped with stationary toilets and showers with modern plumbing. There is a large yurt, where there are lunches and dinners. There is electricity in the camp. Upon arrival in the yurt camp, tourists are offered green tea, which will quench thirst. Before dinner, you can meet the sunset on the barkhana. Folklore performance of akyn at campfire. Stars of extraordinary brightness and the Milky Way will allow you to enjoy harmony with nature. Overnight in the yurt camp. Riding on camels (10-15 minutes). During a walk on camels, tourists will be able to observe the flora and fauna of the desert (up to 25 species of plants and a variety of wildlife). Drive to Lake Aydarkul. Aydarkul is called the "turquoise sea in the sands", every year it expands. A lake in the middle of the desert is not a mirage, but a real miracle of nature. The origin of the crystal clear lake in the southeast of the Kyzylkum desert is very mysterious. Although there is a scientific explanation. In the summer of 1969, the extremely high water level on the Syr Darya River exceeded the capacity of the Chardara Reservoir, and the water filled the Arnasai Basin. A lot of fish appeared in the lake. You will be offered a picnic on the shore of Aidarkul (fried fish is offered). After a picnic, the group will be transported to the village of Centab. Accommodation in a local guest house. Full day excursion to the village of Sentob. The village of Sentob is away from roads and cities in a picturesque mountainous area with fresh air, green gardens, birdsong, sky full of stars, and friendly people. During the tour you can see different kinds of flora and fauna. In the mountains of Nuratau and in the Kyzlum steppe, there are three main ethnic groups: Uzbeks, Tajiks and Kazakhs. 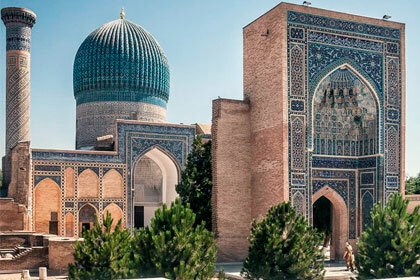 As the largest ethnic group, Uzbeks arrived here in the 13th century from the north of present-day Kazakhstan. The second largest group, the Tajiks, has a more ancient settlement history, dating back to the reign of Alexander the Great in Central Asia. The third ethnic group, the Kazakhs, until the beginning of the 20th century led a nomadic life in the Kyzyl-Kum desert. Transfer to Samarkand (220 km, 4-5 hours). 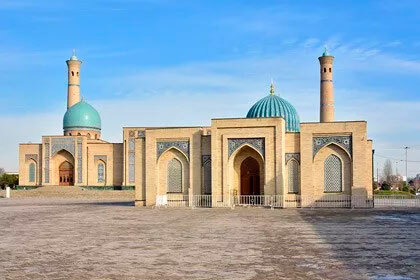 City tour: Bibi Khanum mosque, once the largest mosque in Central Asia, was erected by order of Tamerlane after its victorious Indian campaign in 1399. 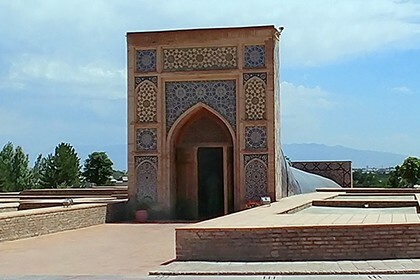 Mausoleum of Kusam Ibn Abbas, the cousin of the Prophet Muhammad, is also in this Necropolis. It consists of 20 mausoleums, built in the period from XI to XIX century. 09:00 Excursion. Memorial complex. Imam Ismail al-Bukhari. 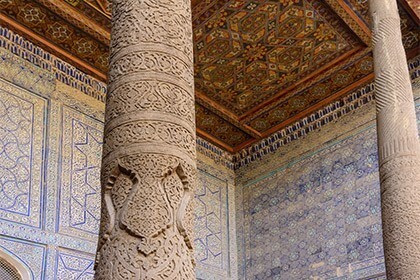 The highly respected scholar of the Islamic world, Muhaddis (the collector of the statements of the prophet Mohammed and stories about him), Imam Ismail Al Bukhari was born in Bukhara in 810 and died in 870 in the village of Khartang and was buried there (the district of the present Samarkand region, located at 30 km from Samarkand). Since then, the burial site has been one of the most sacred places for worship among Muslims. Continuation of the excursion: mausoleum of Gur Emir, the burial place of Amir Temur and other members of his family. 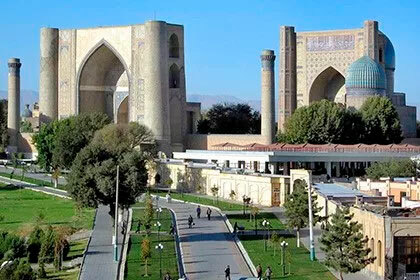 Registan Square, the heart of Samarkand, consisting of the Madrasah of Ulugbek, Sherdor Madrasah and the Tillya-Kori Mosque. Saint Daniel Tomb is the only place in Central Asia that Muslims, Jews and Christians consider a sacred place in their religion. 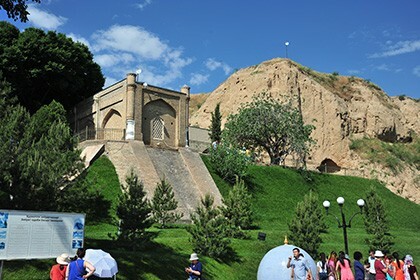 Ulugbek's Observatory is the largest observatory of its time. 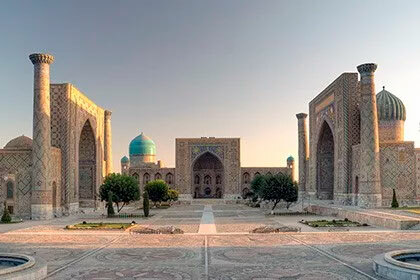 18:00 Transfer by high-speed train "Afrosiab" from Samarkand to Tashkent (300 km, 2 hours). 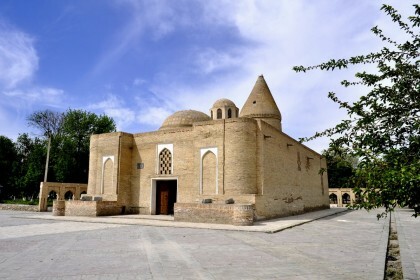 10:00 Visiting sacred places of Tashkent: ensemble "Khazret Imam". Here you can see the oldest manuscript of Uzbekistan, the famous Muslim heritage - the Koran of Osman, which has a certificate of authenticity from UNESCO. 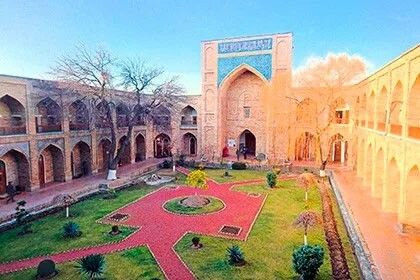 Madrasah Kukeldash, located on Chorsu Square, was built in the 16th century during the reign of the Sheibanikhan dynasty. 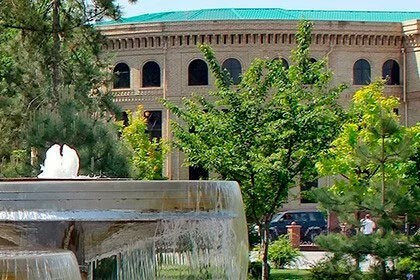 Now it's a college where the basics of Islam are taught. Farewell dinner at the restaurant with a belly dance show. 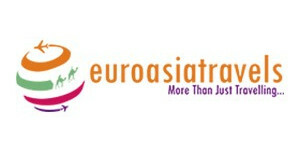 Transfer to the international airport of Tashkent. Supplement for single accommodation: 160 USD.